Hooks may be used in a wide variety of applications for lifting, rigging, towing, pulling, and securing. In many of these applications hooks are frequently used in conjunction with chain. There are specialty custom hooks to be used for rigging and lifting applications. There are many types of forged hooks that can be supplied by Fly Forge with OEM custom forging service. For example, sling hooks to which the load or force is applied to the base (bowl saddle) of the hook, and grab hooks which contain a slot or throat of uniform width for securement on a link of the chain usually to form a chain loop for supporting the load. In addition to the hooks discussed, there are also a number of specialty and non-conventional hooks produced in our company. Clevis Slip Hooks must be matched to the chain size. Designed for use primarily with graded chains and affixed directly to the chain. Available in heat treated carbon and alloy steel. Load must be applied in line with clevis, placed firmly in the base (bowl saddle) of the hook. Eye Slip Hooks should be matched to the size and grade. Designed for use primarily with graded chains. Must be affixed to the chain either with a welded coupling link or with a mechanical coupling link. Load must be applied in line with eye placed firmly in the base (bowl-saddle) of the hook. Rigging hooks are similar to eye slip hooks except with an enlarged eye for larger couplers such as thimbles, etc. This type of forged hooks are produced in heat treated carbon or heat treated alloy steels. 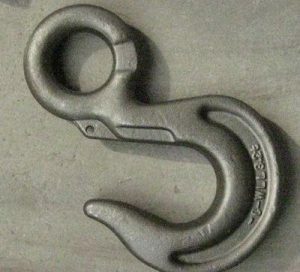 A general purpose rigging hook with optional latch. Load must be applied in line with eye firmly in the base (bowl-saddle) of the hook. Note: The latch is designed to retain such items as slings and chain under slack conditions and is not intended to support the load. A conventional grab hook is designed to be hooked back onto the chain in a choker arrangement. The full working load limit can be achieved if the hitch angle is 300 or greater. If used in other configurations such as direct tension, the working load limit of the assembly must be derated by 25%. Clevis Grab Hook must be matched to the chain size. Designed for use primarily with graded chains and affixed directly to the chain. It is the forged hook available in carbon steel and alloy steel with heat treatment. Clevlok Cradle Grab Hooks must be matched to chain size. Designed for use primarily with grade 80 chain and affixed directly to the chain. It is the forged hook that made in heated treated alloy steel only. Eye Grab Hooks must be matched to the chain size. Designed for use primarily with graded chains. Must be affixed to the chain with a welded coupling link or with a mechanical coupling link. This type of forged hook is manufactured in unheat treated carbon steel, and heat treated alloy steels. Grab Grab Hooks are the forged hooks must be matched to the chain size. Designed for use primarily with Grade 80 chain. Must be affixed to chain with a weldedlink or with a mechanical coupling link. This type of forged hook is in heat treated alloy steel only. Why Produce Hooks in Forging? Forging is defined as a metal working process in which the useful shape of work piece is obtained in solid state by compressive forces applied through the use of dies and tools. Forging process is accomplished by hammering or pressing the metal. It is one of the oldest known metalworking processes with its origin about some thousands of years back. Traditionally, forging was performed by a smith using hammer and anvil. Closed die forging process produces forged hooks of superior mechanical properties with minimum waste of material. In this process, the starting material has a relatively simple geometry of hook; this material is plastically deformed in one or more operations into a final shaped hook of relatively complex configuration. Forging usually requires relatively expensive tooling. Thus, the process is economically attractive when a large number of forged hooks must be produced and/or when the mechanical properties required in the finished hooks can be obtained only by a forging process. Forging is always better for hooks because of the part size (same strength from a smaller part), weight, strength, toughness and ductility properties. Cast parts are larger, heavier, weaker, more brittle and require more expensive inspection techniques due to the probability of internal defects. A forged hook undergoes extensive pressure, so it’s important to inspect them carefully and often for damage, cracks, bending and straightening. Hooks are often forged with numbers to indicate the load information and rating of the device, making it easy to check the hook for integrity and any damage that might have occurred. Hooks come in a variety of styles and capacities for a number of uses, and you can count on Fly Forge to offer just what you need, whether it’s a lifting hook or for other appliations. Be sure to check our forging capabilities for other lifting and rigging supplies, including shackles, weld on grab hooks, weld on D ring, connecting and coupling links, eye blots & nuts, turnbuckles and wire rope. 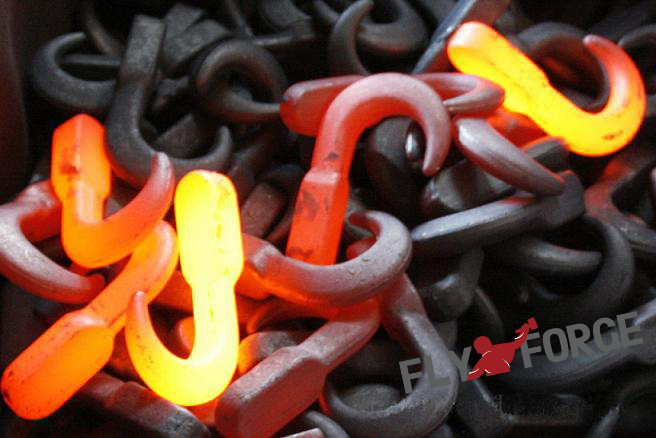 Any inquiry of forged hooks, just pls feel free to contact us. You will enjoy great pricing advantage by forging china.